Ragi puttu is nothing but steamed ragi flour mixed with grated coconut and jaggery/sugar. 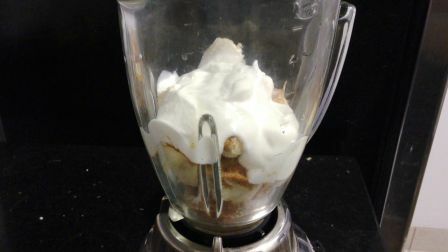 It is very healthy and nutritional recipe. Fiber in ragi give you a feeling of fullness which thereby reduces excess appetite and helps to control weight gain. Let's see how to make it. 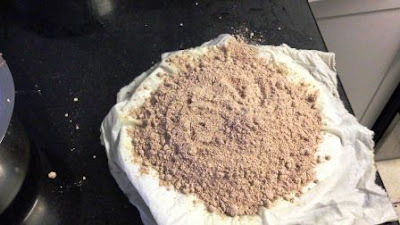 Add 2 cups of Ragi flour in a bowl and moisture the flour by adding little water. 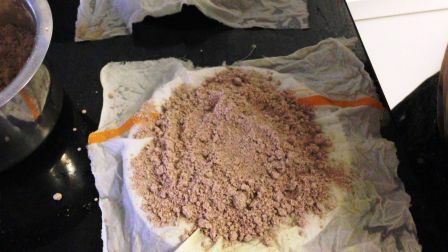 The flour should able to tighten without breaking at same time it should not be more moisture. 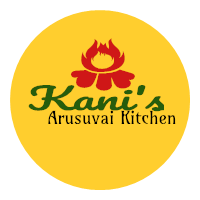 Spread the moisture flour on a white cloth placed on the idli plate. 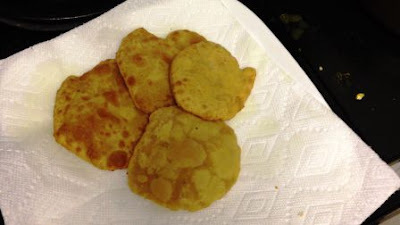 Place them inside idli pan and bake for 10 minutes. Once cooked by steam, place the cooked flour in the bowl. 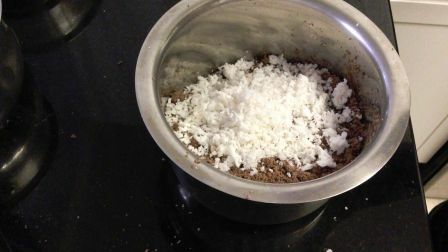 Add 5 teaspoon of sugar, ½ tablespoon cardamon powder, 5 teaspoon grated coconut and mix it well. 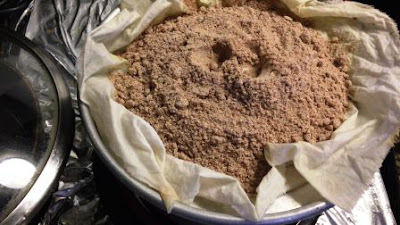 Now put the flour into a tumbler and make a molding. 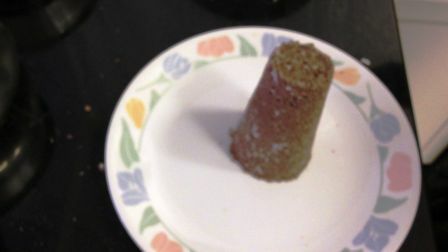 Now Very healthy Ragi puttu is ready to serve. Chatamari is a very popular Newari dish in Nepal. I was watching a documentary where they were showing Kathmandu and at the same time were describing foods available there. Chatamari was one of them! I was kinda hesitant to attempt at first but then I decided to give it a try. And turns out very well. 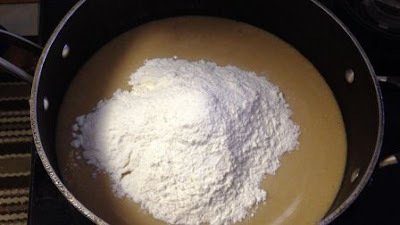 Add 1 cup rice flour and ½ cup all purpose flour in a bowl and make it to a batter. 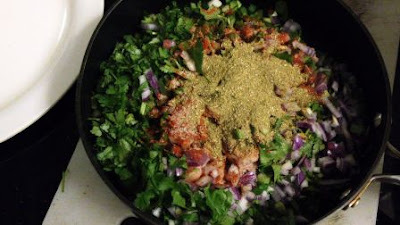 In a separate bowl, add 1 cup ground chicken, 1 chopped onion, 1o chopped spring onion, ½ cup chopped coriander leaves, 1 – ½ teaspoon red chilli powder, ¼ teaspoon turmeric powder, 1 teaspoon coriander powder and required salt and mix it all together. 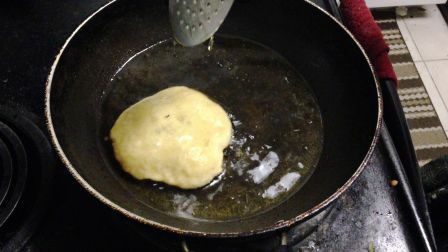 Heat a pan and add 1 teaspoon oil. 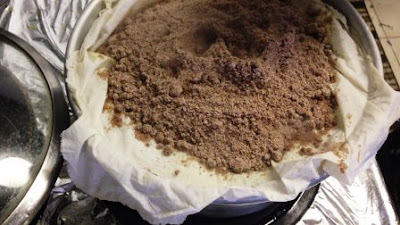 Spread the oil into all the space using a paper towel. 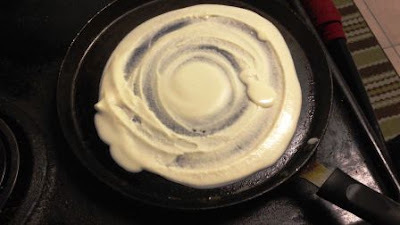 Now add 1 big spoon of batter and spread around pan gently in a circular motion. 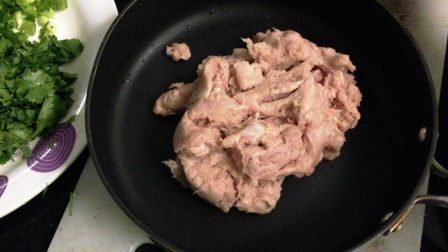 Apply chicken masala on top of batter gently. 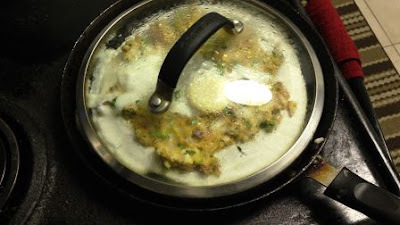 Close the lid and cook for 8 minutes. 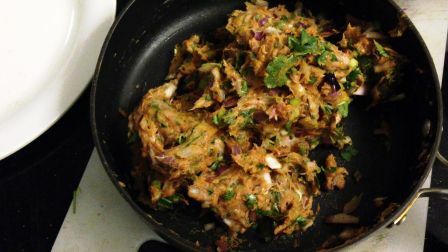 Take out the chataamari into a plate gently. Now the mouth watering Chataamari is ready to serve. Banana stem contains ample amount of fiber, which can prevent constipation and ulcer in the long run. Banana contains lots of potassium and vitamin B6. These nutrients help in retaining muscle tone and increase production of hemoglobin and insulin. 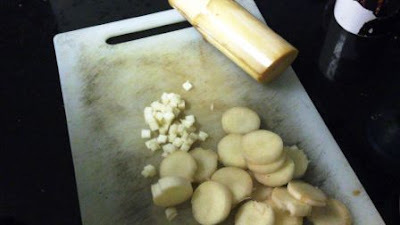 Take one feet of banana stem and cut into small cubes and put into water to avoid getting darkness. Boil cut banana stem with 1 cup of moong dal, required salt until the moong dal cooked well. 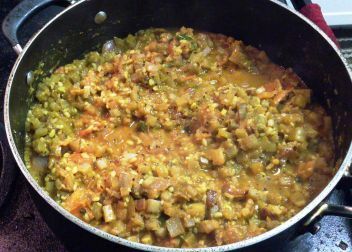 Moong dal will pop out kind of foam. Take out this out with a spoon. 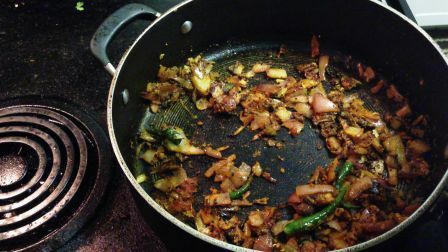 Once moong dal cooked well, filter out the cooked banana stem and dal and keep aside. 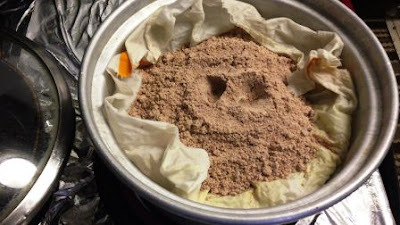 Keep the cooked water for later use. Heat a pan and add 3 teaspoon of oil. 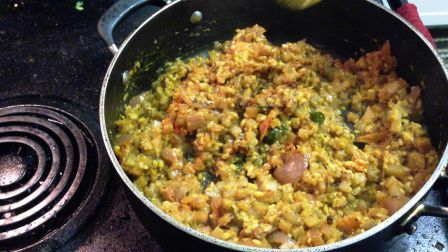 Once oil hot add 1 teaspoon mustard seed, 1 teaspoon Urad dal, 1 teaspoon cumin seed. 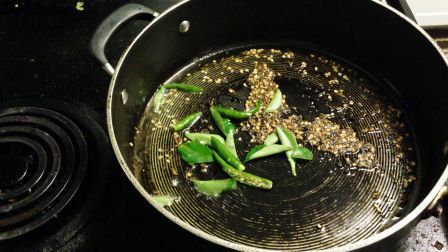 Add 1 spring curry leaves , 3 slit green chilli and stir it when mustard start spluttering. 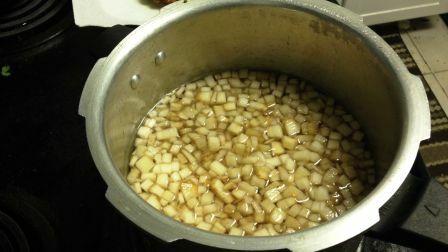 Then add 1 chopped onion and stir it. Cook until translucent. Add ½ teaspoon turmeric powder, 1-1/2 teaspoon red chilli powder, 1 teaspoon coriander powder, 1 teaspoon ginger garlic paste and stir it. 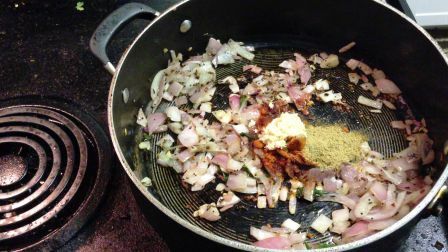 Add 2 chopped tomato and cook for 2 minutes. 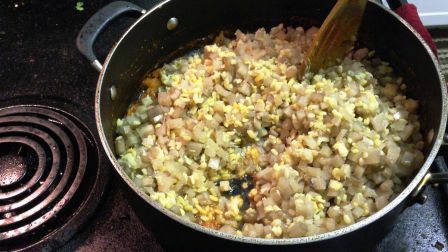 Add ½ cup of water, , required salt and keep cook for 2 minutes. 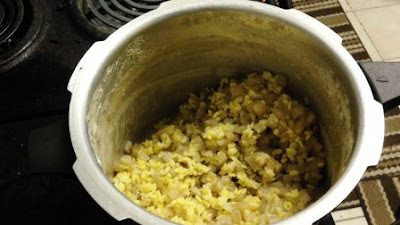 Now add cooked banana stem and moong dal and mix it. Add 1 cup of banana stem cooked water and stir it. (if the water still available, drink it. It is amrit. Close the lid and cook for another 5 minutes. 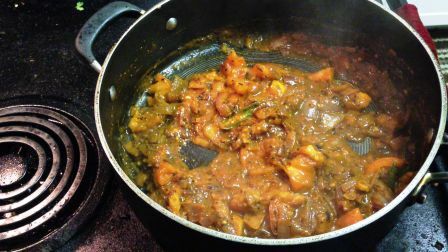 Now the tasty and very healthy banana stem curry is ready to serve. 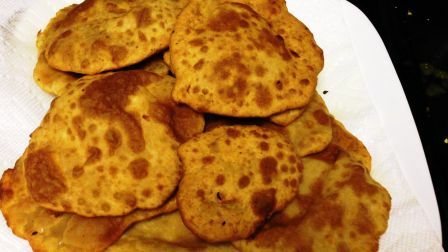 Mangalore buns or Sweet banana puri's are well known recipe from mangalore, karnataka. 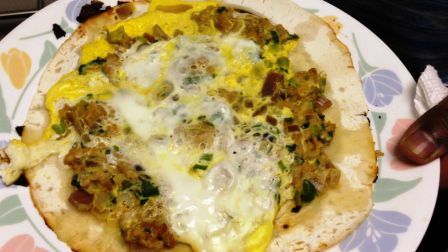 This recipe can be had as a breakfast or even as a snack. They makes delicious breakfast. Generally, it has been taken as plain with morning tea. But, we can have them with some milk and coconut chutney. 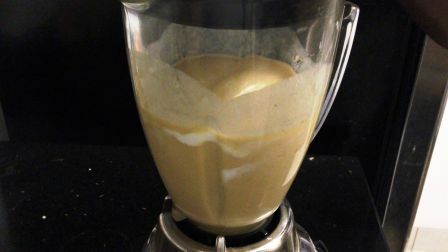 Add 3 banana, 3 teaspoon sugar, ½ teaspoon salt, 4 teaspoon curd into a blender and make in to a smooth paste. 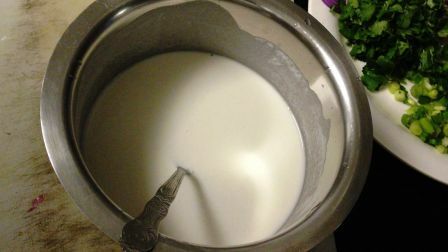 Then pour this mix into a pan. Add 2 cup of all purpose flour and make it like a chapathi dough. 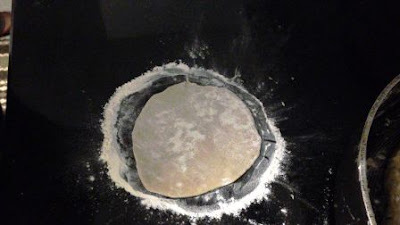 Cover the dough with a cover and leave for 3 hours. 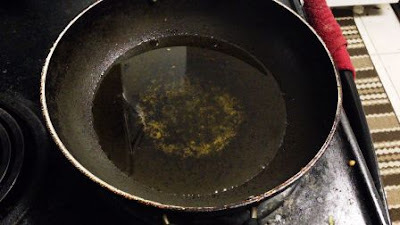 Heat 2 cup of oil in a pan. 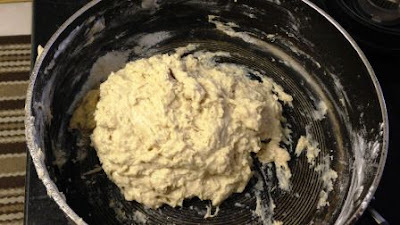 Meanwhile, Make the dough into gooseberry size balls and roll into a small circle. Drop the rolled bun into oil and deep fry until golden in color. Take out and place on a paper towel. Now the banana bun is ready to serve.